Well $twtr as we all know had a massive pop on its IPO and quickly made a move to $75 a share! Unbelievable, but reality has set in. Wait, its not making money, its valuation is sky high, etc etc. So 2014 YTD $twtr is down over 35% sitting at just over $40/share. You could drive yourself up a wall Day trading the stock, but I believe it will be one of those stocks you look at in 3 years and just say, Why didn't I just hold that? ex. $aapl (owned it at 250), $fb (owned it at $25), $sbux (owned it at $14), $dis (owned it at $33), $lgf (owned it at $15). I say this because we all do it. We all pick a stock, get in and sell it for a decent gain or for a quick loss, when really if we stepped back and trusted the company to do what it said it was going to do and just monitor their progress we could all be very rich. Even if they fall short or it takes longer than expected, $40 will seem very very cheap at that point. Not a reccomendation to buy, just educational. 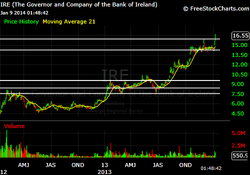 $ire as you can see from the chart has made a run from the middle/end of 2012 till now. It was trading at $5 and change and now is at $16.50 and looks like it could see $20 in the not to distant future. The chart looks perfect. Every gap up has held important levels and consolidated nicely before making new highs. Look for a small pullback or consolidation up in the high 15's or low 16's before a move higher. A break back below 15.80 will mean it is going to need more time. Above that level it could continue its rampage. 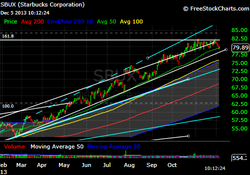 Today $sbux is bouncing perfectly off its 50 Day MA which it has done over and over again the entire year. I wouldn't bet against this trend changing. The growth and Outlook are good, but the price action on this stock is amazing. Do not fight the trend. When it changes you can change. Lionsgate (LGF) has had quite a move in the last two years that is no doubt. Hunger games is a cash cow, but a 10% drop today because of a sell the news and somewhat of a ridiculous under performance 161 million! Wall street wanted a blow out opening weekend with the biggest cash in for a movie. Didn't happen, but now LionsGate is on sale, only .75cents from its 200-day MA we should see that as major major support and a good entry to ride this stock into the $40-45 range by middle of next year. Hunger Games has split the 3rd book (MockingJay into two parts). Also Divergent will be a huge trilogy as well. Book sales are showing signs of a Twilight and Hunger Games repeat. This stock should not only technically bounce at the 200-DayMA it should hold there and continue its beautiful long term trendline higher. I expect earnings to grow by quite a bit now through 2016. This stock could very well be a double over the next three years. There are no guarantees, but in my own opinion i think the odds are in $LGF's for a long time.